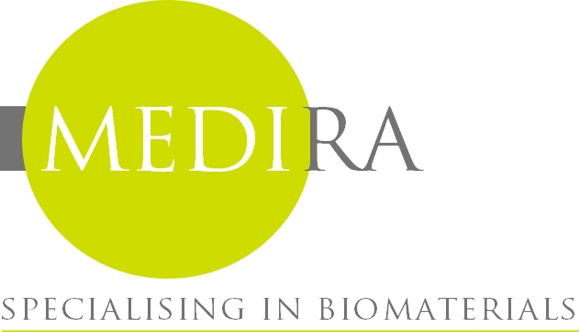 Medira is a Cambridge company specialising in tissue regenerative biomaterials. Biological facilitation of tissue regeneration and wound healing addresses a growing trend. Unlike natural materials, many synthetic advanced wound dressings, lack the functionality to promote a desirable biological response. Collagen is available today in thousands of different products from skin creams to synthetic skin substitutes. It has been used safely and economically for many years in the health care field and is relatively easy to obtain today. Medira is delighted to have a collagen biomaterial derived from a Piscean source. A little known fact is that the amino acids hydroxyproline and proline, present in human Type I collagen, are also present in the Piscean Type I collagen molecule. These findings support the outcomes clinicians observe using the Type I dressing range. Medira’s unique range of Type I wound dressings have been listed on the 2013/2014 NHS High Impact Innovation catalogue, linked to the DOH Health, Wealth and Innovation Programme.